You're not getting enough sleep, night after night, but you continue to push it, hoping it won't do any harm. Then cold season hits, and you find yourself getting even less sleep because you come down with more colds than usual. It's a vicious cycle you can't seem to escape: lack of sleep, cold, lack of sleep, another cold. Is there a connection? Definitely, according to a recent study that suggests people who sleep less than six hours a night are more likely to catch the common cold than people who get more sleep nightly. In the study, published in the journal Sleep, researchers tracked 164 men and women for a week, monitoring their sleep patterns. At the same time, they exposed all study participants to the rhinovirus, better known as the common cold. Results showed that while only 18 percent of participants who more than six hours nightly contracted a cold, 39 percent who slept less than six hours did. On average, sleeping less than six hours a night made participants more than four times more likely to contract the rhinovirus compared to participants who slept seven hours or more. In an article on CNN.com, Shalini Paruthi, director of the Pediatric Sleep and Research Center at Saint Louis University, summed up the research findings: "It looks like an adequate amount of sleep allows our body to mount a better immune response." Having trouble sleeping? 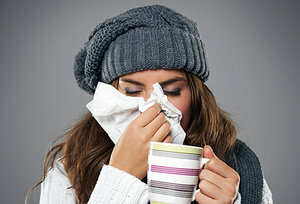 More colds may be on the way this fall (and all year round). Click here to learn more about the health benefits of adequate sleep and how you can ensure you get restorative, rejuvenating sleep tonight– and every night.